PIPPA Middleton has married millionaire hedge fund manager James Matthews in a star-studded wedding at St. Mark's Church in picturesque Berkshire, England. The happy couple was pictured leaving the 12th century church as wedding bells rang out following a short ceremony that lasted about 45 minutes. Outside the hall, Mr and Mrs Matthews waved to spectators hoping to catch a glimpse of the wedding of the year. High profile guests soon followed, including the Duchess of Cambridge Kate Middleton, Prince William, Prince Harry, reality star Spencer Matthews and tennis legend Roger Federer. 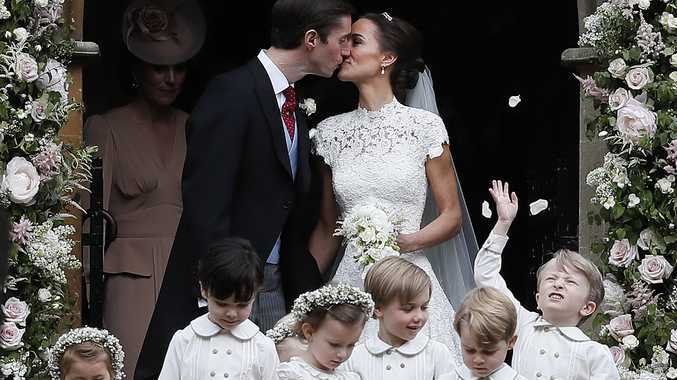 Outside the church, the newlywed couple kissed for the cameras as their bridal party - including the Duchess of Cambridge, Prince George and Princess Charlotte - gathered around them. While a downfall of rain hit just after the ceremony began, the weather cleared as the newlywed couple left the church. As guests filed outside, the bridal party gathered around the happy couple for photos. The page boys and tiny bridesmaids gathered on a garden path while Kate stood alongside her sister and new brother-in-law. Prince Harry was spotted leaving the church with fellow guests but his girlfriend, Hollywood actress Meghan Markle, was nowhere to be seen. While it seems the actress did not attend the ceremony, it's believed she will be present at the wedding reception, being held in a glass marquee in the Middletons' garden in Berkshire. Immediately after the ceremony, Harry was spotted leaving the grounds in a car - presumedly to pick up the actress before the reception. 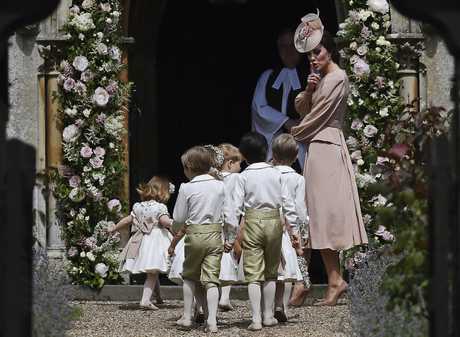 Prince William exited the church with his brother-in-law, James Middleton, as he joined fellow guests in the garden. Earlier in the morning, Middleton smiled at cameras as she arrived at the church in a vintage 1951 Jaguar Mk V.
Escorted by her father Michael Middleton, the bride looked stunning in a flowing white lace Giles Deacon gown with a long veil. The bespoke high-necked gown featured a cap sleeve and a corsetted bodice that hugged the bride's waist. Standing in an archway of the church, the 33-year-old socialite held her father's hand and beamed as she turned to face cameras before walking down the aisle to marry 41-year-old Matthews. After posing for photographs outside the church, the happy couple made their way with guests to Englefield House before driving away from the estate in the vintage Jaguar. They'll gather at the Middleton's mansion for an evening reception. While Pippa's sister Kate Middleton was spotted leaving Kensington with husband Prince William earlier in the morning, the duchess was not pictured outside the church prior to the ceremony - presumedly meeting her sister inside so as not to take attention away from the bride. However, as the ceremony got underway, Kate was seen assembling the children at the back of the hall near an entrance. 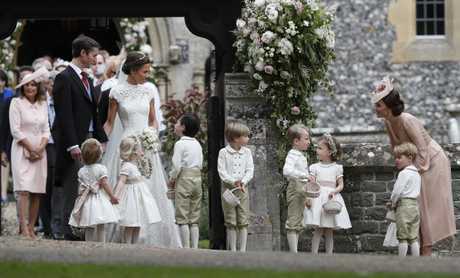 The duchess, along with her children, are among the bridal party as bridesmaids and page boys. Wearing a pale pink dress with matching hat, Kate laughed as she held a giggling Princess Charlotte by the shoulders. Soon after, Prince George was seen entertaining his younger sister with a floral heart. Later on, Kate ushered the children to the rear of the church to make their entrance before the ceremony and was seen shooshing them. Prince William and Harry were among the first to arrive earlier in the morning. The brothers were pictured looking dapper in matching waistcoats on the grounds as they walked into the church. Despite the Harry sighting, there was no sign of his Hollywood actress girlfriend Meghan Markle, who was spotted visiting a glamorous spa in London the previous day. Among the first high-profile guests to arrive at the ceremony included reality star Spencer Matthews, TV personality Donna Air and tennis star Roger Federer. Princess Eugenie left fans disappointed by arriving looking sensible in a navy blue frock and simple white hat. It's a noticeable difference to the more outgoing ensemble the princess wore with sister Beatrice at the 2011 royal wedding.